FOOTBALL PLAYING FOR THE CITY CHAMPIONSHIP – WILL YOU BE THERE TOMORROW NIGHT? Our football team will be playing Woodbridge tomorrow night for the Fence Post trophy as the City of Irvine Champs. We are expecting a sell out tomorrow night. Woodbridge has sold out of their pre-sale tickets. We have pre-sale student tickets available in the athletic office for $5. If you don’t have an ASB card, come get your student ticket so you don’t have to wait in line. Parents – GET TO THE GAME EARLY – if you want to secure a ticket we suggest you get to the stadium early. There will be long lines at the ticket booth. Once we reach capacity we will have to stop selling tickets and not allow anyone else into the stadium. I would recommend being at the stadium by 6:30 if you want to get in. Remember to wear blue and cheer loud for our boys. This is going to be an electric atmosphere and you won’t want to miss it. 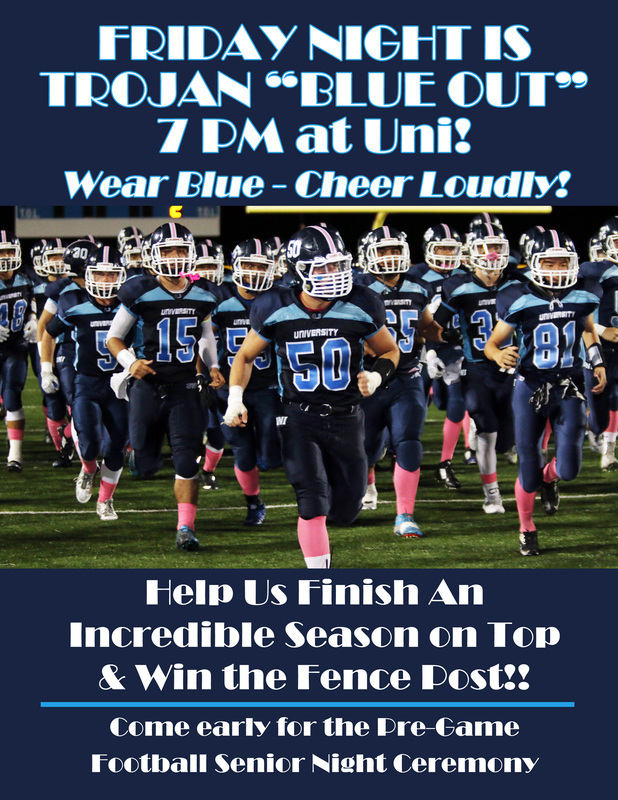 BLUE OUT – If you are going to the game tomorrow night make sure to wear something Trojan Blue. If you have a Trojan Army shirt please wear that. Our students will all be wearing their Trojan Army shirt and we want all of the parents decked out in Blue as well. Boys and Girls Cross Country– Our runners will participate in League Finals this Friday at Irvine Park and we are looking forward to some very fast times. Go Trojan Running! Football is headed back to the playoffs. Our boys knocked off Irvine by a final score of 36-21 last Friday to secure a playoff spot for the first time since 2007. Matt Abellaneda scored 3 times and Sam Winder scored the other two touchdowns for our Trojans. The rushing attack could not be stopped as our boys rushed for well over 200 yards. With the win our team moves to 8-1 on the year and 3-1 in league play. 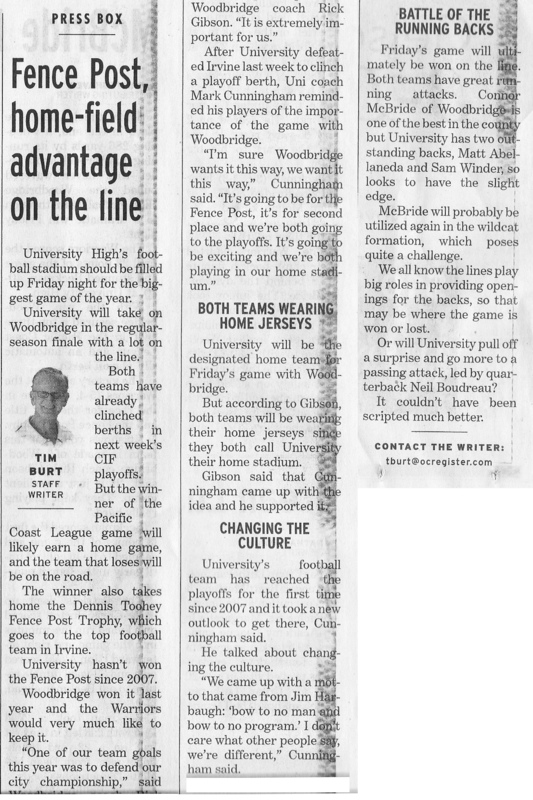 We will play Woodbridge for the City Championship on Friday night. We hope everyone will come out to the game to support the team. 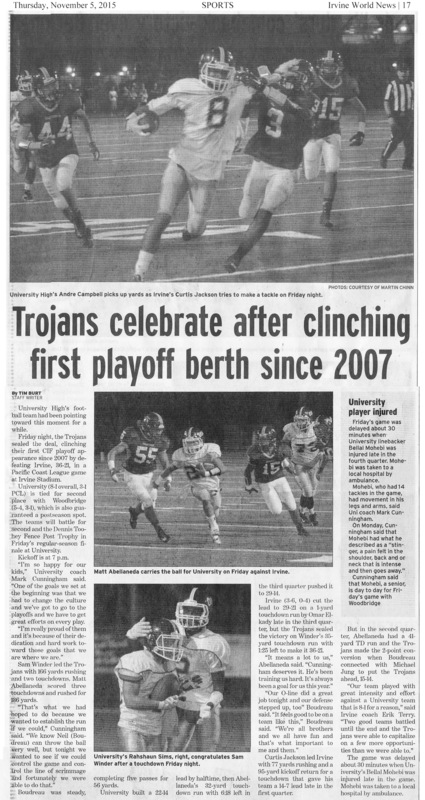 GO TROJAN FOOTBALL! Also, Ellen Takada and Samantha Cabunag are still alive in CIF individual golf championships. They will compete tomorrow and attempt to advance to the state tournament as individuals. Girls Tennis – Our girls tennis team traveled out to Palm Desert yesterday afternoon for their CIF first round match. Our girls pulled out an impressive 10-8 victory. Palm Desert was a first place team from their league. Our girls had a long bus ride home last night and got back after 9:00. We will be practicing today and play in our second round match tomorrow here at UNI v Campbell Hall. The match starts at 2:00. Come on out to the courts and support our girls. Boys Water Polo – Boys water polo ended their season on Tuesday with a 13-17 loss at Woodbridge. 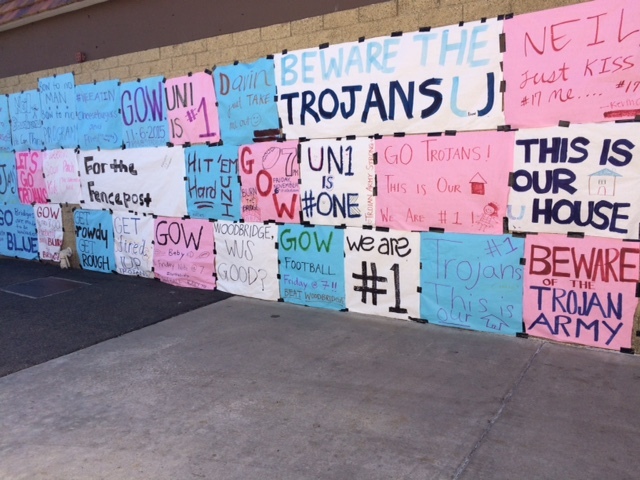 Last Thurs the Trojans fell at home vs Irvine 6-15. UNI finished with 10 victories overall and improved from last year. These are the graduating seniors from the program: Jacob Ghahremani, Caleb Brown, Kian Abolhoda, Daniel Briseno, Ryan Eid, Aydin Yolar. Thank you seniors for all of your hard work this year. Trojan Army Day – Tomorrow is Trojan Army day on Campus. Students will be wearing their Blue Trojan Army shirt to school to show their support for the big game later that night. Please remind your student to wear their Trojan Army shirt to school tomorrow. The campus is buzzing with excitement for the big game. Below is a picture of some of the advertising we have been doing for the game. STAY CLASSY – This is a huge rivalry with a lot on the line but please remember that as a fan of UNI you are representing our school. Please keep all comments positive towards our school and players. We are not going to put down our opponents both on social media and at the game on Friday night. KEEP IT CLASSY UNI! THANK YOU – We had a few very generous donations in our effort to offer spirit give away for this big game. We would like to thank the Keeling Family, Dolan Family, Bell Family, and the Lutito Family for their donations. We would also like to thank Michael O’Loughlin who was the starting QB on the class of 1974 team for making an extremely generous donation. With these donations and the donation from Daily Grill we will be able to give our Trojan Army free spirit towels, megaphones, face paint, and glow sticks. You will not want to miss our team take the field as we have a very special entrance scheduled. If you get a chance please take your family to Daily Grill in Irvine for a bite to eat and thank them for their support of UNI Athletics. Daily Grill 2636 Dupont Drive, Irvine. I am sorry that Tennis was left out this morning. I had a very busy morning and had to publish early. I wrote Trojan Thursday last night and checked OC Varsity late and there was no score. I published early this morning and then talked with Coach Kessler to get the details. I had access to my phone and did post something right away on Twitter about the win. I have been busy with meetings and teaching all day today and was not able to update until just now. I do my best to highlight all UNI athletes. With our girls getting home so late and my busy day I was not able to get a score. I am sorry if you think that is not classy. I am doing my best with what little time I have.